Eating healthy can be, well, slightly boring and monotonous. I love salads, grilled veggies, quinoa and raw foods; although sometimes these can be on the light side. After a hard workout protein is what your body craves. 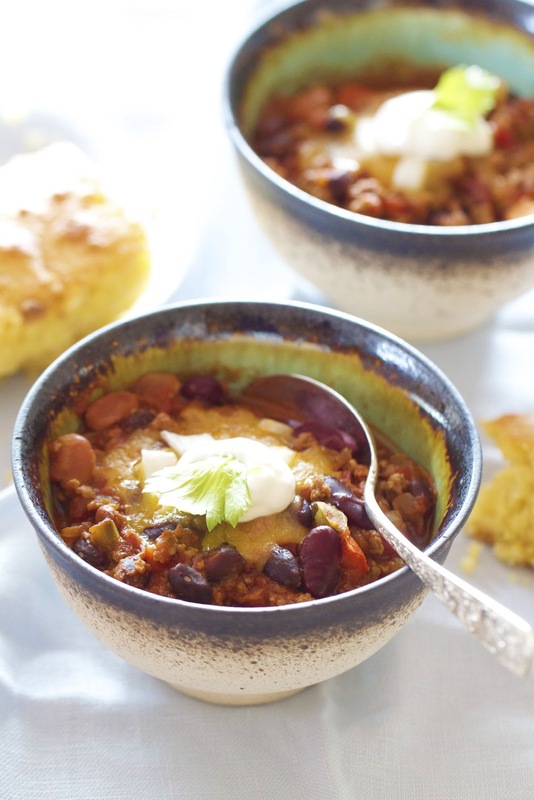 Chili is hearty, healthy and veggie filled...everything your muscles need. A hearty chili meal isn't a "real" chili without its partner in crime...corn bread. 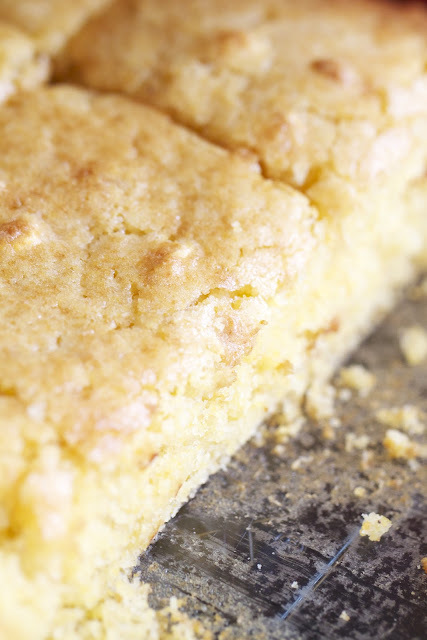 If you want to avoid unwanted calories, skip the corn bread; although I wouldn't recommend it! My chili is super simple, quick and easy to adapt. Heat olive oil and garlic in a dutch oven (or heavy saucepan) over medium-high heat, until fragrant. Add the onions, red/green bell pepper and carrots, stirring until soft, about 10 minutes. Stir in cumin, thyme and oregano stirring for 1minute. Add bay leaf, 21 seasoning salute and beef. Cook beef until no longer pink. Pour water, diced tomatoes, adobo sauce and chipotle pepper. Cook partially covered for 30 minutes. Add black, pinto and kidney beans to chili, cook for an additional 20-25 minutes. Add salt and pepper to taste. Serve immediately, garnishing with cheddar cheese, diced onions and sour cream. I adore a good bean chili but I haven't had one in so long! Thanks for the reminder Katie :) Gorgeous photos as always! This sounds wonderful, Katie. All of the flavors and spices...perfect for a not-boring healthy meal! Mmm, chili is one of my favorite meals. I definitely agree with the cornbread :D I love the chipotle in your chili, I don't usually do that, but I bet it adds a great flavor and spiciness. Great additions to the chili! My dad laughed at me because I took after my mom and HAVE to have my chili with corn bread. Yum, this is definitely one I will be trying. I have seen a lot of chili recipe around lately! Love your version, too. 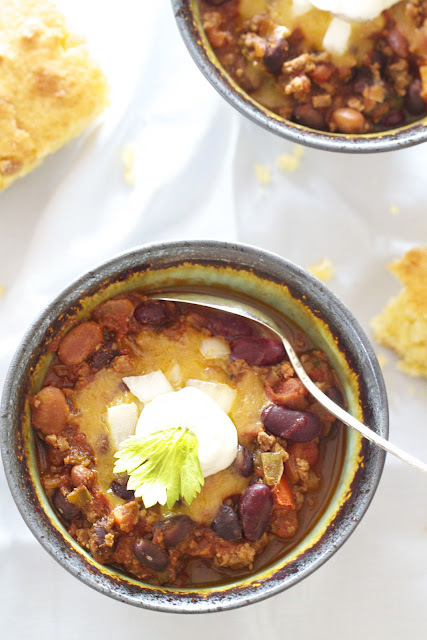 I definitely fall into the "bean camp"when it comes to chili so this is right up my alley! Chili never looked prettier! It sounds delicious too. Mmmhhh, a perfect chili! It looks so comforting and satisfying. Perfect with cornbread. Mmmm... I've never tried chili before, and I can't wait! This looks amazing. And I love the chipotle in there - I just got a can and this looks like the perfect use for it!